Tomorrow is Women’s Equality Day–a day on which we celebrate the passing of the 19th amendment, which gave women the right to vote. However, women’s suffragist movements were not as valiant in their moral victories as we like to remember. The movement rode on the coat tails of the Abolitionist movement, while also using white supremacy as the reason white women needed the right to vote. The argument was if black men were given the right to vote, they’d have more power than white women, and that was unacceptable. White women needed to be given more power to cancel out the political power of black men. Oppression is complicated and seriously messed up. While the 19th amendment didn’t exclude black women explicitly–that would have violated the 15th amendment–there were measures put in place to suppress votes of all people of color. These measures were extremely successful, and to some extent, still exist to this day via voter ID laws. We shouldn’t still have this problem, because in 1965 the Voting Rights Act passed, giving the Federal government the authority to put their foot down when it came to voting suppression. This is effectively when most women of color were able to actually vote. Just because you don’t personally experience sexism, racism, classism, ableism, ethnocentrism, heteronormative bias, or any other type of oppression doesn’t mean those things don’t exist. And we, as a society, can’t effectively combat them until we recognize that they do–and that they wreak very real harm on our fellow citizens. Have we gotten better about these things? Until a few weeks ago I would have said yes. Even if we had, does that mean we should stop where we are because it’s comparatively better than what it has been in the past? No. Because it’s still bad. 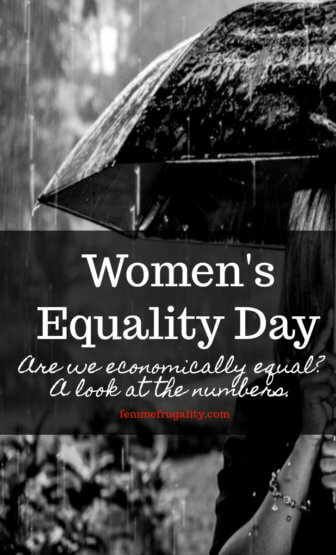 Today, we’ll be looking at women’s equality through the lens of personal economics. The Wage Gap. It Exists. The most recent data on the wage gap is probably most effectively measured when compared to white, non-Hispanic men. This is not because white, non-Hispanic men are inherently evil as individuals, but rather because as a group, they are the most highly compensated demographic. White, non-Hispanic women make 75% of what white, non-Hispanic males make. Black women make 63% of what white, non-Hispanic males make. Hispanic and Latina women make 54% of what white, non-Hispanic males make. Asian women make 85% of what white, non-Hispanic males make. Pacific Islander women make 60% of what white, non-Hispanic males make. American Indian and Alaska Native women make 58% of what white, non-Hispanic males make. Trans women face a 12% pay decrease after transitioning. But women choose lower paying fields. Yes. Career choice does contribute to a portion of the gap–though not all of it. We need to look a little bit deeper than that, though. Why does society value an accountant over those educating the leaders of tomorrow? Lawyers above nurses? Read this: Should Teachers Ever Make Six Figures? We don’t want to confront this reality, but women took on many of these roles for a long, long time without receiving any pay. In light of this, it’s not really all that surprising that some of the most important jobs–like daycare workers ensuring the safety and early education of our children–get compensated at rates barely above minimum wage. Then there’s the question of why women enter these fields. Do we do it because we were trained from a young age that our gender gave us inherent gifts in care-taking fields? Or are there simply more opportunities for women in fields that pay less? Either way, the answer is problematic. Yes, some of us do. But in one way or another, men play a role in making those babies, too. Aside from a brief period of physical recovery for women, there’s no reason men can’t equally contribute to the care and rearing of their children. In fact, when they contribute to that cause, they are viewed as altruistic. When women do the same, they are viewed as incapable of meeting their work responsibilities–even if that’s not true. I’m pretty sure that argument is not only problematic, but inherently false. Except we do. When we ask for a raise, we’re 25% more likely to get denied compared to our male counterparts. Because women are discriminated against in the realm of pay, we’ve led the largest boom in the entrepreneurial sector over the past ten years. This is in large part due to the entrepreneurial efforts of black women in particular, who face one of the largest pay gaps. Our daughters are not as confident in matters of personal finance as our sons. It’s not because we are trying to actively oppress our individual daughters, but it may be because we subconsciously give in to a system of oppression that we have normalized as a part of our culture. We need to combat these measures by talking to our daughters more, and educating ourselves more about personal finance concepts–even if we’re not marketed to. I was at a conference last year where my peer pointed out a present online marketer advising against using Pinterest as a platform for advertising investment content–because the platform is dominated by females and women just don’t care about investing. This is but one example of the culture we’re up against. We have to market to women whom we don’t think care. Not only because it’s the right thing to do, but because women own 40% of all stocks and make 85% of consumer purchasing decisions, which includes financial products. We have the right to vote, but we have a long way to go before we’re economically equal. As with the suffragist movement, this is especially true for women of color. Men, take solace in the fact that women’s equality is not about tearing you down or blaming you as an individual. But if we, men and women, want our daughters, mothers, sisters, partners and friends to be equal, we need to work together against the systems of oppression that do indeed exist. New Year. Old Goal. New Energy. This entry was posted in Think on August 25, 2017 by femmefrugality. This is a very thought provoking post. I am glad you are not afraid to take on political and socio-economic issues in your blog! Thanks, Lizzy! Comments like yours keep me doing it. It’s an intimidating venture, and sometimes I mess up and cause offense where I mean none. But I feel like it’s important. Coupons and budgets are great, but there are some bigger underlying issues to people’s finances that need to be addressed. “Just because you don’t personally experience sexism, racism, classism, ableism, ethnocentrism, heteronormative bias, or any other type of oppression doesn’t mean those things don’t exist.” – Exactly. And the current situation (the current administration) is making it abundantly clear that we *all* need to speak up and speak out on behalf of those who are experiencing these things. I’m trying to find ways to do that wherever and whenever I can. Thanks for doing it in this post. Exactly. It’s so weird because I feel like things that were just mildly controversial a year ago (i.e. the wage gap) are now wildly so. We have an opportunity to speak up and bring attention to these things in a magnitude they may not have garnered in the past, but we’re also walking a dangerous line if we remain silent and let oppressive voices take control. I had no idea about some of those stats. I also wonder what Asian women are doing to manage to get the smallest wage gap. I want to learn their secrets. Those are some pretty fascinating stats. And it’s true what you say about the early feminists being far from enlightened by our standards today. I just read in the paper today a piece about how few of the “heroes” of our history had attitudes that would be tolerated by us now. The suffragettes were, as you said, racist, and many stood for eugenics as well. In many ways, we’re very lucky to live when we do. Thanks for clarifying where the challenges lie so that we know in which direction to take that next step.